Linnea Wong lights up her torch, adjusts her safety glasses, and aims the flaming torch at the end of a long, slender glass rod. Soon, a bead of liquid glass forms. Wong deftly inserts a thin metal rod through the middle of the molten glass. This is the beginning of a unique, handcrafted glass bead. She adds thin layers and tiny dots of colored liquid glass. The colors begin to emerge. The bead is finished and placed in a kiln to cool slowly so that it won't crack when exposed to the cool air of her studio. This tiny bead is a small sample of Wong's art glass magic. Wong's glass creations include jewelry, functional pieces and sculpture. 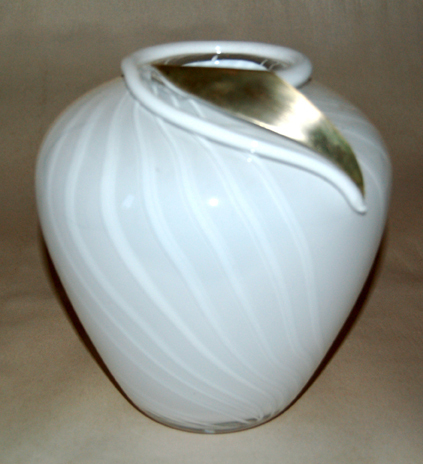 She also is versatile in ceramics, jewelry-making, metal working, furniture design and graphic design. Her glass works range from dark, luminous fused glass plates with swirling inner light, to peaceful, nature oriented glass "paintings." Wong's strongest designs are graceful and confident with Asian influence. Since graduating from the California College of Arts in Oakland, CA, Wong has worked primarily as a free-lance graphic designer. At CCA she majored in graphic design and minored in ceramics. Wong arrived in Davis in November 1996. Her work has become more sophisticated, simpler in many ways. Currently she is returning to the clean Scandinavian lines of her heritage. You can see her work at the Artery in downtown Davis. Linnea's studio is Design in West Sacramento. Wong's work can be found in many respected galleries throughout the United States. In 2008, Linnea Wong and Patrick Mullen, joined together to create a full spectrum glass studio - Design with Fire in West Sacramento. They combined forces to teach, practice and explore the wonderful world of glass. Drawn together by a love of glass in many forms, they want to help you explore glass, metal, and various mixed media. Linnea teaches numerous glass and jewelry classes at this spacious facility. Wong assists Patrick Mullen at Fire River Art Glass in West Sacramento teaching glass blowing. Beginning classes and Three day blowing seminars are currently available. To contact Wong about classes at her studio- Design with Fire or Fire River Glass , send her an email at linneaw@sbcglobal.net.